This image doesn’t do justice to one of the world’s best seascapes. Still, there’s a lot to like. Off to the right rises an iconic Oregon headland, its upper slopes dressed in a maritime forest of Sitka spruce. Tillamook Head rises a thousand feet above the sea. Back on the beach, its mirror image awaits erasure by a swash on the make. A ripe peach glow, set up by evening clouds, tints a foamy run up. I can still feel thunder from the dark breakers beyond. And there is something different on the horizon. Just left of center, in the distance, you may be able to pick out Tilly, the deactivated lighthouse perched on Tillamook Rock, just a mile off the head. It’s different because human constructions are rare in my posts. I confess, however, to a recent exception. A Deep and Shallow History from a Nearby Shore featured a deactivated roadbed. A fun choice Steve – you’re right, I seldom see man-made images on your blog. This is a nice exception! And a fun challenge it is. I’m glad I tried it. Thank you. Tina, Just an amusing note about my reply to your comment. I started typing my reply but had to step away from my keyboard. When I came back I found my cat Cleo had managed to paste in the title to the subject post, hit a few returns, and send. I’ll let it stand. Beautiful. I miss that coast but hope to be back soon. It’s waiting for you. Good luck getting back! 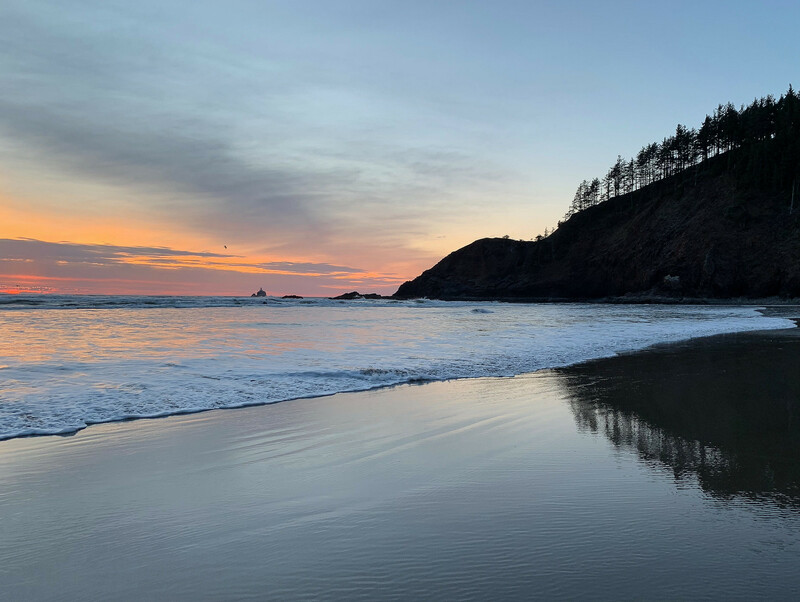 The image is from Indian Beach at Ecola. You can see the lighthouse from Cannon Beach on a clear day. It’s only about two miles south of Indian Beach. Thanks! Go Cleo—a very DIFFERENT kind of cat!! Gorgeous shots! The light and colors are exquisite.